For medium sized groups, we offer a 49 – 53-Seater Coach complete with relaxing seating, ample luggage space, and onboard entertainment to keep the groups comfortable and engaged on those longer trips. We offer both a Standard Hire and a Luxury Hire version of this package. Our 49 – 53-Seater Coach package is the ideal choice for stag dos, teambuilding events, school trips, and church group outings. We can place our reliable, powerful and comfortable coaches at your disposal for hours, days or even weeks, and we can get the vehicles to you in as little as 30 minutes. 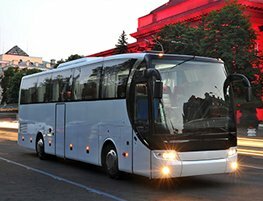 Featuring ergonomic seats, the 49 – 53-Seater Coach is the optimum choice for large groups of people, ensuring a timely arrival at the tourist attraction or the event in question, and a comfortable and safe journey there. Hire our 49 to 53 seater coaches and enjoy the peace of mind that comes with putting together a well-organized outing with an experienced and vetted professional driver behind the wheel.